The latest from adidas basketball, the adidas D Rose 3.5 puts a new twist to the adidas D Rose 3.0, adding to the fashionability as well as playability of the sneaker. It fits a little closer to the foot for an all around more stable fit, and the new spiral Sprintweb pattern is simply mesmerizing. The newest colorway, the adidas D Rose 3.5 Red/Black/White features a classic Chicago Bulls color scheme executed to a tee. Comprised of an upper dressed in predominately red, this new colorway will look great with the Chicago Bulls away uniforms. To add some contrast, Black shows through the Spintweb design on the toe box, and it is also used on the inner lining as well as the D Rose spiral logos. For a clean look, the midsole and Sprintframe plate on the heel of the sneaker features White color blocking. 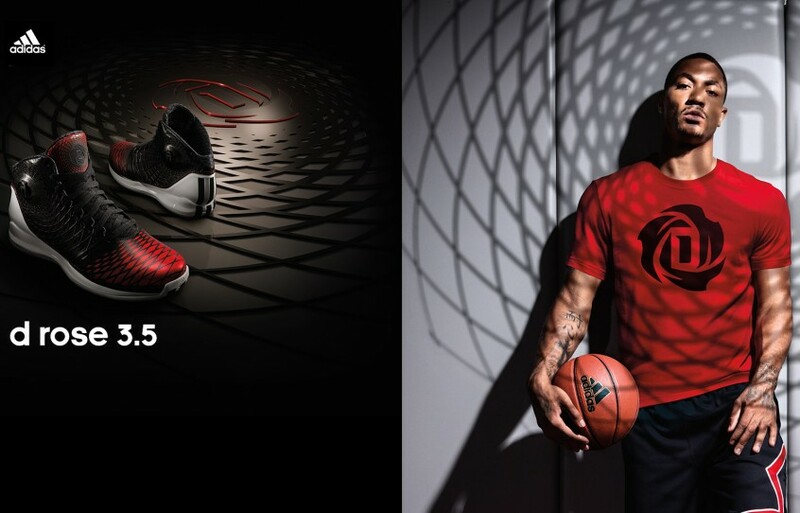 Will we see Derrick Rose himself lace up in the adidas D Rose 3.5 Red/Black/White this season? That all depends on the status of his injury, but since the superstar has returned to full contact practices as of this week, things are looking good for Derrick Rose and the Bulls this season. Look out for this new colorway and more to come of the adidas D Rose 3.5 on Finishline.com. College Basketball Game of the Week: Indiana at Michigan St.